Welcome to a new feature for The Barrel, where each month Platts’ oil experts in offices around the world will outline the five big trends or factors affecting oil markets. From Asia to the Americas, we’ll assess the leading issues in crude and refined products over the past month, and those that may have an impact in the future. But this isn’t just about what we think. We’d like your views and insights, as participants and observers in the oil industry, as to what issues are driving your markets, your business, or your views. Be sure to leave a comment and tell us what you think, and we will collate the best answers and re-post as a new post to share with our readership. For now, here are Platts editors’ big five. There’s no interruption to oil and gas flows yet, but Russia’s Gazprom has warned sanctions could lead to disruptions of their gas exports, and the most recent sanctions against Rosneft leaders is ramping up the tension. How much pressure will sanctions — and Russia’s response to them — put on crude and gas prices? Colombia is looking for a new outlet for its oil, now that production has surged in the US, and it quickly changed direction and headed east, taking oil to China and India. Chinese imports from Colombia in the first quarter of 2014 were nearly double the year-ago quarter, but on the other hand, a recent research report showed China in an “oil recession,” with oil demand declining for six months in a row. So how much is China actually consuming, and how does demand vary among the various products? 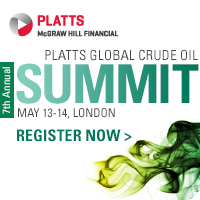 Platts 7th Annual Global Crude Oil Summit sets a unique global agenda, inviting industry leaders to share views on the critical developments affecting the upstream and trading communities. Facilitating the exchange of genuine value between the industry’s senior executives, the summit provides a perfect environment to encourage stimulating debate and interaction with the speakers and your peers. The first cargo into the new Pengerang terminal in Malaysia arrived just in time for Petronas to make a final investment decision on plans for its $16 billion Refinery And Petrochemical Integrated Development (RAPID) project in southern Johor state, expected to come online by early 2019. RAPID is part of the larger Pengerang integrated petroleum complex, which is along one of the world’s busiest shipping lanes. Will this strengthen Malaysia’s role as a player in the Asian chemicals market? Strikes and protests in mid-2013 prompted exports from Libya to dwindle down to almost nothing in January and February, but protesters agreed in early April to release the ports of Marsa al-Hariga and Zueitina. The first cargo left the 110,000 b/d capacity Marsa al-Hariga in mid-April, and the first lifting in more than nine months out of Libya’s 70,000 b/d Zueitina export terminal is expected later this week, after Libya’s state-owned National Oil Corp. lifted force majeure on the terminal on April 28. Does this mean exports will continue to increase? The production surge in the US is pushing stocks up to soaring levels along the US Gulf Coast as more barrels have been traveling down from the Midwest via the Marketlink Cushing pipeline. It’s prompted some to talk of barging crude from the Gulf Coast up to the East Coast, and refineries along the coast are reaping the benefits of plentiful supply. There are other projects in the works, like the BridgeTex pipeline, to carry even more toward the Gulf Coast, which begs the question: how much is too much? Great suggestion–we seriously considered putting India on this list, particularly with regard to its crude imports, as we mentioned in the point about China. According to shipping data obtained by Platts, India’s imports of Colombian crude had a more than three-fold jump from Q1 2013 to Q1 2014. The two most important things are the high crude inventories in US, wich will fall in the summer due the driven season, and the crisis in Russia even there will not be any interruption and how will EU reduce the dependance from russian energy. At http://www.terrajoule.us, the call is that Non-OECD oil demand is in the process of recovering and accordingly the snapshot, currently, is uneven. The signal from China, however, comes via their strong rebound in the 2H of electricity generation. In other words, China’s economy is no longer quite as weak as it has been the last 36 months. Meanwhile, OECD oil demand has finally washed out, and bottomed, after a 10 year decline. What matters in this regard is that the 10 quads of oil which the OECD shifted to the Non-OECD can be thought of as a supply operation that has now come to an end. All that’s need now for upward price pressure on oil is an uptick in Non-OECD demand, which we see unfolding over the next five years, starting now. The problem with Gulf Coast stocks is that increased production (and storage) of condensate is responsible, not real crude oil. If domestic crude oil (i.e. API < 45) production was really responsible, then you would see an offset in imports and you don't…. santions should be removed to pave way for escalation of higher prices affecting the oil economy from Rashid PIEA Hass Petroleum…. It’s a fair question. So many other pathways have been created in the wake of XL not being approved that the oil is not as stuck as it appeared to be. But still, if XL is not approved, there are two scenarios that are fairly negative. First, more oil by rail, with the specter of fiery accidents–and possibly tragic ones–always a part of the landscape. Two, while the other pathways appear to be allowing oil now to get to market, there is no assurance that they will keep pace with the rise in production. And as an aside, the opponents aren’t fighting this because they think there’s too much oil in the Gulf Coast. So that’s a red herring argument. If #5 is true, is the Keystone XL pipeline really needed?